Living on campus offers many advantages and has been proven to enhance student success at Texas A&M University. We attribute that in part to the variety of spaces to support academic success on-campus. Search the various types of spaces available in our residential communities. Please note, not all types of spaces are available in each residence. In Residence Life, we call these rooms ‘special-use-space.’ Since these spaces are versatile and can service more than one purpose. Our multipurpose rooms have accommodated classes, student organization meetings, departmental functions, trainings, banquets and more. These rooms have re-arrangeable furniture, technology (including microphones, loud speakers, white boards, and more), and are eligible for reservation requests. Leadership Learning Centers are academic support facilities for the Texas A&M Corps of Cadets. These centers surround the Corps of Cadets quad and offer computer labs, study spaces, tutoring rooms, and other academic support services. Hullabaloo Hall, The Commons Lobby, and White Creek Community Center have music rooms where students may play their instruments. A piano is located in each of these rooms. Keys to these rooms can be checked out at the 24 Hour Desk for each of these facilities. 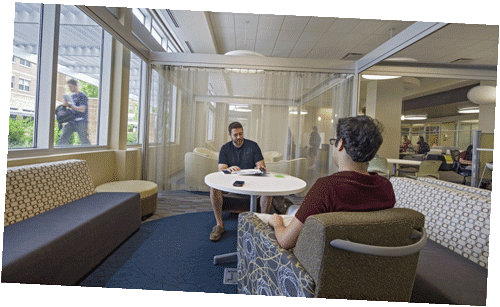 Many residence halls and our apartment communities have areas specifically designated for studying. A quiet environment is observed there at all times. All of our residential facilities, excluding the Corps of Cadets, have dedicated TV lounges and programming spaces. These spaces offer space to conduct our social and educational programs and can be used by residents who want to watch movies, play games, or get together with our residents and friends. A great way to release some stress from academics, the game rooms offer a variety of recreational equipment from pool tables, ping pong tables, to gaming console. Equipment is provided and may be checked out at the Game Operation Desks in Hullabaloo Hall, Building D, The Commons Lobby, and the White Creek Community Center.